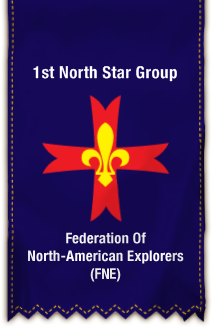 FNE Explorers – 1st North Star Group | Federation of North-American Explorers | Semper Parati! Greetings, and welcome to the Internet home of the 1st North Star Group of the Federation of North American Explorers (FNE). We are the second group in North America, and the first in the USA, and are affiliated with FSE in Europe. This site is currently under construction. Please be patient with us! You can read more about our movement and about the 1st North Star Group in particular, see how to contact our leaders, or read some recent posts.